Kitchen and Bathroom Resurfacing is an affordable alternative to a complete renovation where you can save up to 70% off of the price of conventional renovations. Contact us on 1300 558 548 for more information how you can save time, money and the environment! 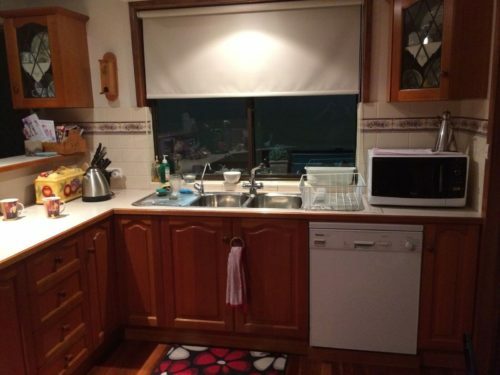 If you are looking to upgrade your kitchen in Adelaide, but don't have the budget to completely remake your joinery, or don't want to put up with the mess, then Resurfacing 2 Pac finishes are the ideal solution. Resurfacing rather than replacing your existing kitchen cupboards can create huge savings on your overall renovation budget. At a cost between $1,700 to $3,000 for resurfacing in 2 Pac you can save from 60% to 80% on the cost of brand new kitchen joinery or bathroom vanity. When replacing new joinery, you need also to consider additional costs of plumbing, electrical, painting etc which can bring new kitchen costs between $10,000 to $25,000. There is also the disruption to your day to day living caused by managing without a kitchen while the current one is being constructed and installed. What price do you put on your convenience? If the layout to your existing kitchen works for you, and the joinery is in reasonable condition, then why spend money where you do not need to? Resurface the cupboards, update the handles and have you instantly created a fresh NEW look for a fraction of the cost of a whole new kitchen. In addition to the cost savings is also the fact that you still have a perfectly functioning kitchen (minus doors and draw faces) for the short duration of the resurfacing process. It's a win/win situation any way you look at it. When the doors are away at the workshop, all remaining surfaces can be 2 pac resurfaced. Once removed, your joinery doors will be taken back to modern facilities where 2 Pac application is undertaken by skilled trades people in an environmentally controlled workshop, ensuring that the highest quality finish is achieved. Be wary of other resurfacing companies that spray your joinery on-site, as this can result in poor finish quality due to an uncontrolled environment. When your items have been completed, they will then be returned with all the doors and drawer faces returned in their original location. 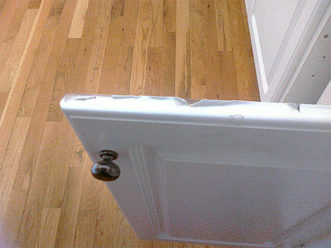 This is an ideal opportunity to replace your old door handles. Flawed vinyl wrap finishes can easily be rectified. Resurfacing existing tile splash backs will give you a great modern look. call the team at Adelaide 2 Pac Kitchen Resurfacing on 1300 558 548 today! We are constantly receiving more and more enquiries from people who have DREADED VINYL WRAP KITCHENS that are peeling and falling apart and these people are desperate to remedy their situation. Unfortunately, Vinyl Wrap Kitchens cannot be repaired or re wrapped. The only way to fix a peeling vinyl wrap kitchen is to completely strip all surfaces and remove all of the glue from the MDF. The good news is that after stripping and resurfacing with 2 pac it will look like a brand new kitchen. Kitchen resurfacing is not just limited to doors and drawers. 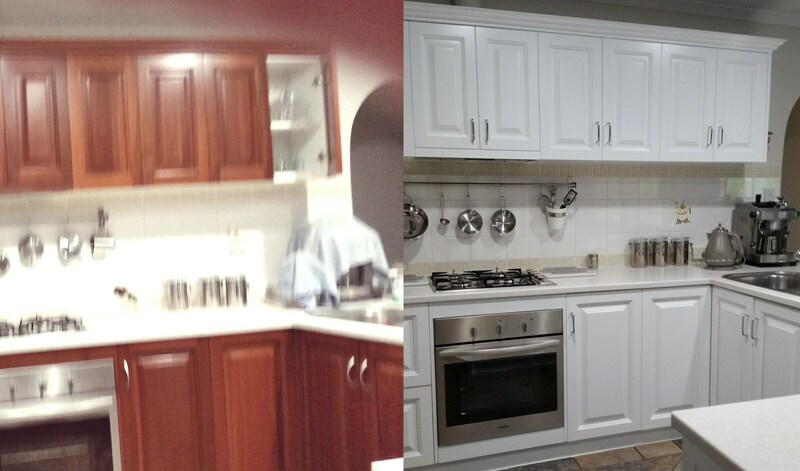 Not only can Kitchen Cabinets be resurfaced, but Splash-Backs and Tiles can all be successfully given a new lease on life with this technique. 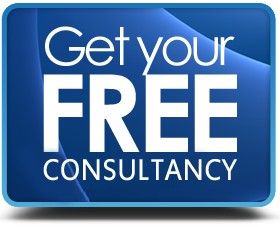 Contact us today if you would like a free consultation and a solution to your peeling vinyl wrap kitchen doors and drawers. Hi Guys hope you are well. 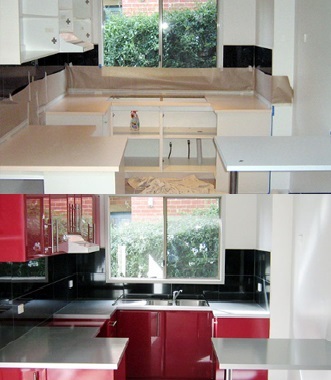 I would like to thank you for putting us on track to what I feel is a great Kitchen Reno. I thought you may be interested in this photo showing before and video showing the near completion. A big thanks to you & Luigi a fantastic done on our Kitchen !